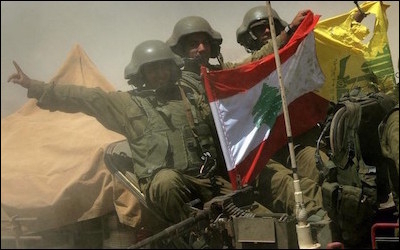 Israeli soldiers returning from the front with captured Lebanese and Hezbollah flags, July 25, 2006. For those of us who took part in it, the war remains quiet and always just in view, like a suitcase filled with items of memory in the corner of a room. It was an entirely inglorious and partially botched and inconclusive affair, a "major and serious missed opportunity," as the second report of the Winograd Committee termed it. It has also been rapidly forgotten. This, it seems, is the way of the small wars that Israel fights these days. None of them passes into legend, as did the great conflicts of the state's foundation. Today's conflicts, after a short time, become largely the private property of those who participated in them. This may not be a bad thing. Perhaps it is akin to the rapidity with which Israeli cities clean up and move on after terrorist attacks. Still, the long quiet on the northern border that has followed the 2006 war has helped to further obscure some of the lessons of that summer. It is worth, therefore, recalling in unforgiving focus some of what took place. Ten years of quiet on Israel's northern border have helped obscure the war's painful lessons. A cabinet led by people with minimal security experience (and a prime minister now serving a jail term), and an IDF led by its first chief of staff from the air force, set out for war with the Iranian proxy Hezbollah organization on July 12, 2006. It is now evident that no coherent and achievable plan for the conduct of the war had been decided upon at the rushed and overheated cabinet meeting that set it in motion. This problematic, unprepared leadership was in turn commanding an army ill-suited for the war it would need to fight. There were two reasons for the IDF's state of unreadiness: The first was practical: The 2006 war came immediately after five years of intensive counter-insurgency, in which the IDF was engaged against a large-scale Palestinian uprising. The demands of the second intifada left little time for training for conventional war. Israel lacked a coherent and achievable plan for the conduct of the war. The challenges faced by troops at that time were considerable. But they were mainly of a police-like nature, not employing or testing the specialized skills of front-line military units in battlefield conditions. This army in 2006 found itself facing a well-armed, mobile enemy, on terrain that the Israeli side knew far less well than its foe. The resulting difficulties were compounded by a second, conceptual, issue. The 2006 war was not the fight the army was expecting. Then chief of staff Lt.-Gen. (res.) Dan Halutz expected to spend his period at the IDF's helm facing the key challenge of the Iranian nuclear program and focusing on ballistic missile defense. Future wars, it was assumed, would be fought using air power, with small numbers of trained specialists on the ground. As a result, resources had in preceding years been diverted from training the large reserve land army. It was assumed that this was a force unlikely to be used. Subsequently, in 2006, some reserve armored formations went into battle against Hezbollah having taken part in only one training exercise using tanks in the previous half-decade. Full disclosure: I was a member of such a force. These were the circumstances in which Israel went to war in 2006. The war for the greater part of its duration consisted of limited ground operations by the IDF in an area adjoining the border, air operations up to Beirut, as well as a successfully maintained naval blockade; and on Hezbollah's side, defense of areas under ground attack and a successful effort to maintain a constant barrage of short-range rockets on northern Israel. A cease-fire came into effect at 8 a.m. on August 14, 2006, following the passing of UN Security Council Resolution 1701. The end of the fighting found some IDF units deployed at the Litani River, but with Israel far from control of the entire area between the river and the Israeli border. Hesitant political leadership and lack of an overall plan for the war were the reasons for its inconclusive results. Looking back, it is clear that hesitant Israeli political leadership and a lack of an overall plan for the war were the reasons for its inconclusive results. Had the IDF, even the poorly prepared force that entered the war of 2006, been presented with clear orders at an early stage to move forward into Lebanon, according to one of the available plans for achieving this, a less ambiguous result could have been achieved. No such order was ever given. Much public anger followed the war and its inconclusive results, as Hezbollah and its friends in the West sought to build a narrative of "divine victory" from the events. From the perspective of a decade later, however, much of the euphoria of Hezbollah and the despair on parts of the Israeli side seem exaggerated. The results of the war from an Israeli perspective in 2016 are mixed. The border has indeed been quieter since 2006 than at any time since the late 1960s. This fact in itself says more about Hezbollah's true assessment following the damage suffered in 2006 than any Al-Akhbar editorial excitedly proclaiming divine victory.